One of the new features in Photoshop CC that might have slipped by you is a little gem that can help make your life easier when working on complex .psd files with tons of layers. Isolation Mode unclutters your Layers panel by only displaying the layers you're currently working on, and temporarily hiding everything else. To enter Isolation Mode, with the Move tool active (press the V key on the keyboard), select the layer or layers you want to focus on, either by shift- or cmd-clicking on them in the Layers Panel, or by command-dragging (ctrl-drag, if you're on Windows) a selection around them on the canvas. With your cursor over the canvas, right-click and choose Isolation Mode from the resulting contextual menu. Alternately, with your layers selected, you can click on the Filter menu at the very top of the Layers panel and choose Selected as the filter type. 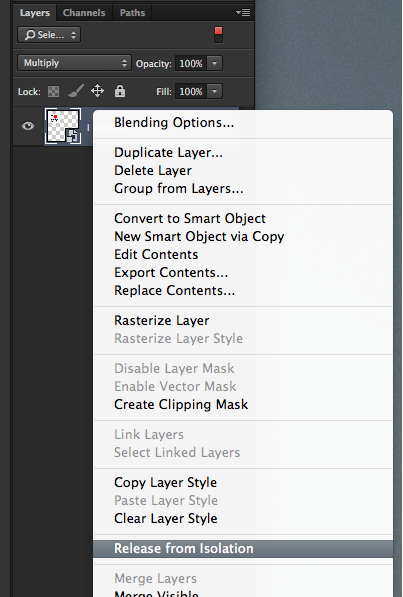 Right-click in the Layers panel to release a layer from Isolation Mode. To remove a layer from the isolated set, right-click it in the Layers panel and choose Release from Isolation (if you don't see that option in your contextual menu, make sure your Move tool is active). 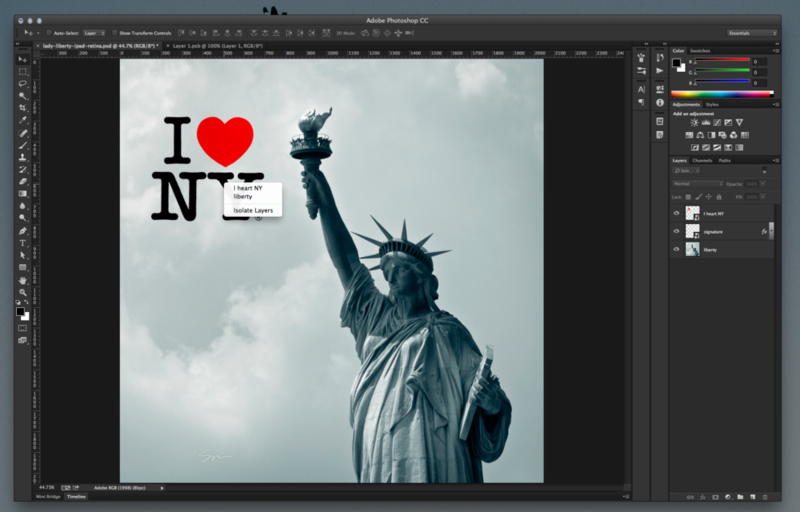 To add another layer to the isolated set, hover over it on the canvas, right-click, and select the layer. Finally, to exit Isolation Mode entirely, you can always clear the Layers Panel's filters by clicking on the Filtering On/Off switch (it's the little guy at the top-right of the panel that turns red when filtering is on). This is one of those great features that you probably didn't realize you needed, but now that it's here, you'll wonder how you ever got by without it.